The red harvester ant is one of the few species the Texas horned lizard will eat for food and is considered a staple of their diet.. These ants are the best ants i have found for any of the ant farms we sell due to the size and ability to eat through the gel of the gel ant farm we offer. Buy ant farm ants here on sale now. Venom: Bite is Painful and can require medical attention if allergic to it. 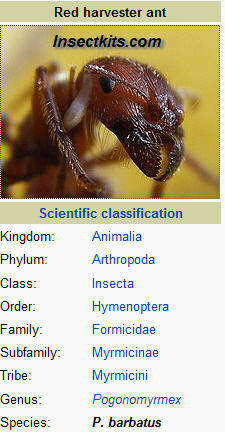 Food:The harvester ant eats mainly vegetables and seeds it gets from foraging but also will eat insects and bugs.